Be the first to hear about their new releases and deals. Download the Booksprout app and search for Harlow Layne today! 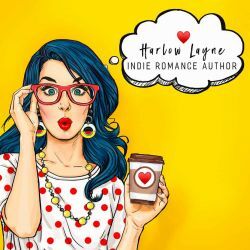 Harlow Layne is an emerging author of small-town and Hollywood romance. Harlow wrote fanfiction for years before she decided to write Luke and Alex’s story that had been swimming in her head for years. When Harlow’s not writing you’ll find her online shopping on Amazon, Facebook, or Instagram or hanging out with her family and two dogs.